I bought my E. trigona 'Red' two and a half years ago, a little before leaving the garden center job. It survived fine and was willing to grow for me, but it didn't produce any branches, on any of the five stems in the pot, for the first two years I had it. This seemed especially strange because the green version of the same plant was branching a lot. So this spring, I divided the five stems into individual four-inch (10 cm) pots. Four months later, three of the four that remain (one was traded away) are beginning to branch. This makes me happy, in that they're doing what they're supposed to do, and a little anxious, because this signals that they're going to become increasingly top-heavy in a hurry, and they were already pretty top-heavy. But overall I think I'm more pleased than anxious. I don't know if the timing is just coincidence or not. It makes sense that crowding cuttings in a pot might inhibit them from spreading out, that maybe they have some sense of how close their neighbors are and behave accordingly. (I have vague memories of reading something to that effect once, even.) But it's also possible that this had nothing to do with the division, and is instead a much-delayed reaction to the fertilizer I started giving them six months earlier. 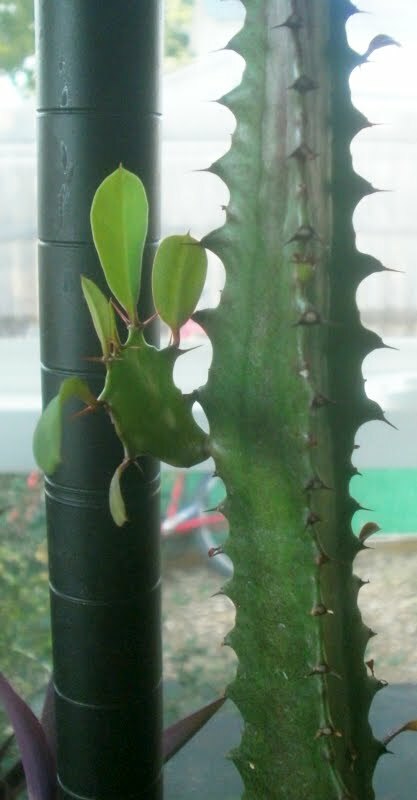 Has anybody else had this experience before, where a Euphorbia started branching when it got different treatment? I think it's a root signaling thingummy...like when the roots have reached a certain level of development, morphological changes are prompted to make for more photosynthesizing surface area. Or something like that. I have no abstracts or degrees to back that up, though. The 'Red' i bought from you started a branch this summer. Also the new growth has been coming in a nice red color. It has been in almost fun sun most of the summer. I can't wait for mine to start branching. But it's young, probably oh 2 feet tall? Is there a set time when they start to feel that I-want-to-branch-out-and-hug-someone itch? Like Paul (the first Paul) said, it seems to be related to the amount of root space they have; my green ones branched weakly when in 4-inch pots, then more vigorously in 6-inch pots; the red ones didn't branch at all when planted together, but have started to since getting their own individual 4-inch pots. Fertilizer also seems to be important; in the case of the green plants, they branched more when moved to larger pots, but it accelerated when I started feeding them more regularly. Height probably is some of it; the green ones were about 18 inches tall when they began to branch (I'm guessing -- I didn't write it down at the time or anything), and the red ones are all about 24 inches tall now. I wouldn't up-pot a plant that didn't need to be up-potted just to try to get it to branch (it'd probably just rot, I'm thinking), but feeding more, or more often, might do something. If it's too short/young, though, it might just not be ready to branch yet. Euphorbias do what they want to do. I have various subspecies that have grown several inches along the main stem each year and just now are starting to put out side branches. They all seem to have a unique personality. It's not the most scientific answer, but that's been my experience.